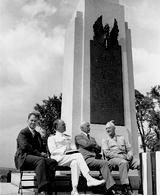 1940 With Orville in attendance, Dayton, Ohio dedicates the Wilbur and Orville Wright Memorial on a hill overlooking Huffman Prairie. 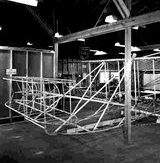 The 1903 Wright Flyer is removed from the Kensington Museum and stored in a stone quarry for safekeeping during World War II. 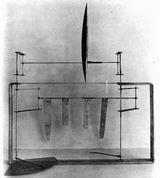 Sikorsky makes the first successful helicopter flight; prehistoric cave paintings are discovered in France. 1941 As World War II approaches and because Orville Wright is a consultant to the US Army, US military escorts bring Orville back to Ohio from his vacation home on Lambert Island in Canada. It is the last time he ever visits the island. 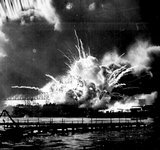 Japan attacks Pearl Harbor and the United States enters World War II. 1942 Orville Wright designs an encryption machine for the US Navy. It is similar to German "Enigma" machines but cannot be deciphered by the primitive computers being used by National Cash Register to read coded German communications. The Smithsonian finally recants their 1914 report on the Langley Aerodrome and recognizes the Wright brothers as the first to make a controlled, sustained powered flight. The first electronic computer is built in the U.S. and Bell Aircraft tests the first U.S. jet airplane. 1943 His feud with the Smithsonian over, Orville recalls the Flyer I from England but it can't be shipped home until World War II ends. 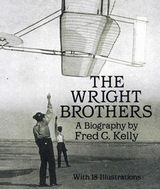 Fred G. Kelly publishes the first authorized biography of the Wright brothers, written with Orville's input and permission. The Allies stop German advances in Italy, North Africa, and the Soviet Union. 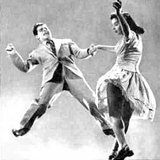 "Jitterbug" dance craze begins and Rogers and Hammerstein produce Oklahoma. 1944 After setting a speed record flying a prototype Constellation across America, Howard Hughes lands in Dayton, Ohio and gives Orville Wright his last airplane ride. The Germans fly the first operational jet fighter, the ME-262. 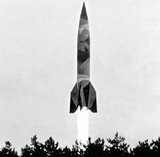 They also launch V-2 rockets against the Allies. 1945 The aircraft carrier the USS Wright is launched and christened at Camden, New Jersey by Orville's niece, Ivonette Wright-Miller. 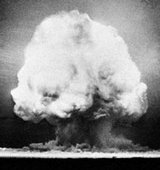 First atomic bomb is detonated at Alamogordo, NM. World War II ends. 1946 Orville rediscovers the original 1901 Wright wind tunnel balances and airfoils in the attic of his laboratory ― they were lost when Orville moved there in 1916. These are donated to the Franklin Institute in Philadelphia. 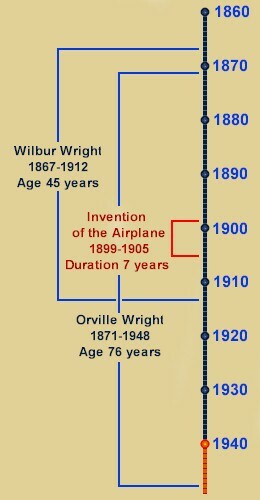 1947 Orville Wright assists in the restoration of the world's first practical airplane, the 1905 Wright Flyer III. It will later be installed at Deeds Carillon Park, a museum dedicated to Dayton's history and its role in transportation technology. 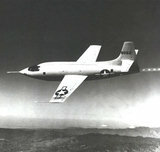 Chuck Yeager breaks the sound barrier in the Bell X-1. 1948 Orville Wright dies of a heart attack in Dayton, Ohio and the Wright brothers' first powered airplane, the 1903 Flyer I, is enshrined at the Smithsonian Institution. Israel becomes a nation, the Hell's Angels motorcycle gang forms in California, and Albert, a rhesus monkey, becomes the first astronaut riding a V-2 rocket to an altitude of 40 miles.